Aspiring paralegals can get caught on a job carousel. You need experience to get a job, but you need a job to get experience. In this episode of the Paralegal Voice, host Vicki Voisin talks to Julia Dunlap, president of the American Association for Paralegal Education (AAfPE), about how paralegal education has changed, trends in the profession, and what employers are looking for when hiring a paralegal. They also discuss ways for young paralegals to get off the job carousel, including investing in certification and which school to choose. Julia Dunlap is the American Association for Paralegal Education’s president for 2017 and the director of legal education for UC San Diego Extension. Intro: Welcome to The Paralegal Voice, where you hear the latest issues and trends in the world of paralegals and legal assistants by one of the best-known paralegals in the industry, Vicki Voisin. A paralegal for more than 20 years, Vicki is dedicated to helping legal professionals reach their goals. You are listening to Legal Talk Network. Vicki Voisin: Hello everyone. 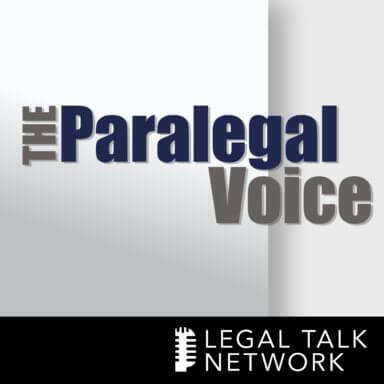 Welcome to The Paralegal Voice here on Legal Talk Network. I am Vicki Voisin, the paralegal mentor and host of The Paralegal Voice. I am a NALA Advanced Certified paralegal. I publish a newsletter titled ‘Paralegal Strategies’, and I am also the co-author of ‘The Professional Paralegal: A Guide to Finding a Job and Career Success.’ You will find more information at HYPERLINK “http://www.paralegalmentor.com/”paralegalmentor.com. My guest today is Julia M. Dunlap, Esq., the current President of the American Association for Paralegal Education also known as AAfPE. So welcome Julia. Julia M. Dunlap: Hi Vicki, thank you for having me. Vicki Voisin: Happy to have you. Now before we begin, our sponsors should be recognized and thanked that would be NALA, a professional association for paralegals providing continuing education and professional certification programs for paralegals at HYPERLINK “http://www.nala.org/”nala.org. NALA is a force in the promotion and advancement of the paralegal profession and has been a sponsor of The Paralegal Voice since our very first program. Next is Boston University, offering an online certificate in Paralegal Studies. If you are seeking a professional credential or just want to further develop your skills, Boston University provides an affordable, high quality 14-week program. Visit HYPERLINK “http://www.paralegalonline.bu.edu/”paralegalonline.bu.edu for more information. And then ServeNow, a national network of trusted prescreened process servers. Work with the most professional process servers who have experience with high-volume serves, embrace technology, and understand the litigation process. Visit HYPERLINK “http://www.serve-now.com” serve-now.com to learn more. The goal of The Paralegal Voice is to discuss a wide range of topics important to the paralegal profession and share with you leading trends, significant developments and resources you will find helpful in your career and your everyday job. And for that reason, I’ve invited Julia Dunlap to be with me today to discuss AAfPE’s role in the paralegal profession. We will also discuss some suggestions for choosing a school and also current trends in the profession. So let me tell you just a little bit about my guest. Julia M. Dunlap, Esq. is the current President of the American Association for Paralegal Education, also known as AAfPE, and the Director of Legal Education at the University of California San Diego extension where she oversees the ABA-Approved Paralegal Certificate, as well as the Intellectual Property Certificate and eDiscovery and Litigation Technology Certificate programs. Julia has played an active role in Paralegal and Legal Studies Education for 18 years. She writes and speaks on current issues affecting paralegals and the education of paralegals, and in addition, she teaches every quarter at UC San Diego’s legal education programs. She was nominated twice for Distinguished Faculty of the Year, while an adjunct professor at Palomar College, and in 2015 was named one of San Diego’s top attorneys in academics. Julia received her Bachelor of Arts degree in English from the University of California at Berkeley. She graduated with her Juris Doctor degree from the University of San Diego School of Law and became an active member of the California Bar Association in 1993. In addition to her duties at UCSD, she is a solo practitioner in San Diego specializing in Estate Planning. So Julia, again, thank you for joining me today on The Paralegal Voice and I’m so looking forward to discussing AAfPE’s role in this profession. Julia M. Dunlap: Thank You Vicki, so am I. I really love what you do with these podcasts. Vicki Voisin: Thank you. Thank you. Well, the American Association for Paralegal Education, which I’m going to call AAfPE from now on, has really played an important role in the paralegal profession, and as a past President of NALA, I had the opportunity to attend the association’s conventions and become acquainted with many AAfPE members and officers. When my term as past President of NALA was done, you were coming into your work with AAfPE. I don’t know if our paths ever crossed them. Julia M. Dunlap: I think that we met at one of the conferences. Your picture is very familiar to me, as I’m sure, you know, we meet a lot of people. Vicki Voisin: Well, I even thought your picture looks familiar, so maybe we have. Vicki Voisin: Well, what I’d like for you to do as we start is to tell our listeners a bit about AAfPE’s history and mission. Julia M. Dunlap: Okay, well AAfPE as an organization was established in 1981. Prior to that it was kind of a — they were working with the ABA but they officially became the organization we have now in 1981 and they are today, the nation’s largest organization dedicated to promoting quality paralegal and legal studies education. We have about 400 members currently and our mission is to promote quality paralegal education and we oversee programs. We’re not like the ABA, which I know we’re going to discuss in a little bit, but we do have educational quality standards for our members. Vicki Voisin: Well, I have been familiar with AAfPE of course, and I know that you directly influence the paralegal profession, but can you elaborate on that a little bit? Julia M. Dunlap: Yes, I think the main way that we influence the paralegal profession is through quality paralegal education, that we educate future paralegals to be the best paralegals they can be by setting our standards. In addition, when a future paralegal is looking for a program we have a lot of information on how to choose the best program. So our development of the educational standards for our members I think is the way we most directly influence the paralegal profession. Vicki Voisin: Well, I hate to say that I’m probably a dinosaur in the paralegal profession, because when I started I was in-house trained. There were no – or there were very few schools, none that I could get to easily. We had never heard of online, and so back in 1974 which was before AAfPE came into being, I had an attorney who decided to train me but you can’t do that anymore. I know that we had to start with AAfPE but can you tell me how paralegal education has changed over the years? Julia M. Dunlap: I would think that the biggest change is, like you mentioned is that you now have to have education. Almost every State in the United States requires you to have some type of paralegal certificate or a degree or something similar. I’m in California which has one of the most strict codes in regards to who can call themselves a paralegal. So I would think that’s the main — the main difference is that the education exists and that it’s very difficult like it was maybe 20 years ago to walk into a law office and they could say, “Okay, you’re a paralegal.” It doesn’t work that way anymore, you have to show that that you’ve had training of some kind, and well, we can talk about all the different types of programs there are. But I would say that is the biggest change over the last 20 to 25 years is that you have to have some type of certificate or a degree in Paralegal Education to work as a paralegal. Vicki Voisin: Absolutely. Now, what are the current trends in paralegal education? How has that changed? Julia M. Dunlap: Yeah, it’s technology, technology, technology. I mean that’s the biggest trend. Employers are expecting that the paralegals they hire know how to do things basically that they don’t know how to do. I mean I graduated from law school in 1993 at a time when there was no vision as to eDiscovery or electronic filing or even the Internet. It was the books, we learned in the books and we learned in court. And so, many of the attorneys of that generation are hoping to hire someone who knows things that they don’t know how to do. So there’s an expectation for paralegals especially that they have those technology skills from the get-go, once they’re hired. So what we’re finding in the educational programs is it’s becoming a requirement that we cover more than just basic computer skills, that we talk about things like eDiscovery, that we are showing the students what is necessary to know in order to exist in today’s world, and the legal profession has changed drastically in regards to digital information and the courts going into an electronic filing requirement. Vicki Voisin: Well, who would have ever thought that the attorneys would have their computers at their desks and also be producing documents. Vicki Voisin: That was unheard of when I started, so I understand that we’ve had all these changes. One other thing that I think is an important not skill for paralegals but maybe something that they should remember is that they’re really on the front line with these technological developments. The attorneys don’t have time to explore what their firm needs or any of that but paralegals are exposed to a lot of information and I think it’s really our responsibility to take that information back and to make some suggestions on how this new technology is going to benefit the firm and that they have to move into and I think attorneys are getting more receptive to technology, they know they have to do that. Julia M. Dunlap: Definitely, and that’s they just did, they have to, I mean every State is adopting ethical rules in regards to things like eDiscovery and the attorneys’ duties are now including having technological skills and understanding the new processes and if they’re not and it’s harming their client in some way we’re seeing a lot of ethical opinions coming out where the attorneys are being sanctioned or some type of disciplinary action for their failure to keep current on the rules. I recently wrote an article for NALA’s Facts & Findings, called “Paralegal Education in the e-World”, I’ve kind of — I’m sure I didn’t make up that name but that’s how I see things, everything is eDiscovery, eFiling, eBay, whatever it is. We’re living in that electronic world now and there’s no avoiding it, and I believe the legal community has tried to avoid it for as long as they can, but it’s caught up to them now whether it’s an attorney, whether it’s the paralegal, you can’t get by in this day and age without understanding technology. Vicki Voisin: — but we’re there, how’s that? Julia M. Dunlap: Right, for sure. Vicki Voisin: Julia, it’s time to take a short break for a word from our sponsors, NALA. The Association of Legal Assistance and Paralegals, Boston University, and ServeNow, a nationwide network of trusted pre-screened process servers. Be sure to stay tuned because when we come back, we’ll continue our discussion about the American Association for Paralegal Education with the Association’s President Julia Dunlap, Esq. Are you looking to advance your career? Do you know of someone who wants to enter the paralegal profession? Boston University’s fully online Certificate in Paralegal Studies is a fantastic option. It’s affordable, takes just 14 weeks to complete, and is led by accomplished faculty who teach employer-focused skills like legal research, writing, technology, and more. Visit HYPERLINK “http://www.paralegalonline.bu.edu/”paralegalonline.bu.edu for more information and to download a free brochure. That’s HYPERLINK “http://www.paralegalonline.bu.edu/”paralegalonline.bu.edu. Vicki Voisin: Welcome back to the Paralegal Voice. I am Vicki Voisin. My guest today is Julia Dunlap, Esq., current President of the American Association for Paralegal Education, also called AAfPE. We are discussing AAfPE’s role in the paralegal profession, including suggestions for choosing a school and current trends in the profession. Now Julia, my readers and listeners contact me with their questions about choosing a paralegal program. They want to know if it has to have ABA approval. They want to know if they can take a program online. So what I would like to know, what are your suggestions for choosing a school, the criteria and so forth, what should they be looking for? Julia M. Dunlap: First and foremost, I think they need to do their homework. There’s many websites out there that can tell you whether a school is ABA approved. They need to know, are they looking to get a degree at the same time, do they already have a degree and they just are looking for a certificate. How important is ABA approval in their community? I mean, I live in a community where it’s almost impossible for an entry-level paralegal to find a job if they don’t have an ABA approved certificate, that’s what employers are looking for. Not to say that there’s not other opportunities for them if they don’t have an ABA approved certificate, but that’s kind of the gold standard for our community. And I think that’s becoming the trend across the United States. But for anyone that’s looking for a school, that’s one of the first things they should try to explore. Are the employers in their jurisdiction or their community, where they are looking to find the job, are they requiring an ABA approval, because if they are, then they need to look for an ABA approved school. They could look at job listings to find that out, they could talk to professionals in the community, they could talk to the paralegal associations, whatever it may be, but do your homework. Vicki Voisin: Okay, Julia, it’s my understanding that there are not any online programs that are approved by the ABA, is that true? Julia M. Dunlap: That’s correct. So currently the ABA does not approve any fully online paralegal programs. The ABA allows a program to have some online classes. There’s a limit on the number of units or credits they allow. For my own program, I don’t have any fully online paralegal courses. I find that the traditional classroom is the best way to talk about the profession for the students to have one-on-one contact with their instructors, who may — the instructors may be a paralegal, they may be an attorney, just having that classroom experience I believe is best for the students. But there are some — not to say there’s not quality online programs, but they are not ABA approved. Vicki Voisin: Okay. Well, let me ask you what are employers looking for when they hire a paralegal beyond their education? Julia M. Dunlap: Well, they are looking for — beyond their education, they are looking for what other maybe employment they have had, is there anything that could be — would be relevant to a legal profession. I mean, I have students that come and they have no legal background, but they have other ways that we can enhance their resume, even if it’s retail experience, that’s customer service experience. Paralegals deal a lot with clients, so that ability to talk to people and have the one-on-one is important. And I mentioned technology before; obviously if they can highlight what technology skills they have, if they can type 75 words a minute or they are proficient on Lexis or Westlaw, anything to kind of pad that basic paralegal certificate is what we suggest for our students. Vicki Voisin: Okay. Now, I hear from a lot of new paralegals, they have graduate from a program, often it’s not ABA approved, but beyond that they are struggling to find a job, no experience, no job. You can’t get experience unless you have a job, so they are on this merry-go-round. And I am not sure how they can get off. Do you have — I tell them to try to work in a law office in any way they can. I also — one of my suggestions is if they are off in the summer, try to get a job that is doing something in a law office or related to that so that they have that experience on their resume. But what else do you tell them? Julia M. Dunlap: Well, I kind of go back to the basics, where I say, your resume needs to be perfect. With students I have that tell me they are having a difficulty finding a job, we go back and look at why that might be, because at least in San Diego, there’s very low unemployment in the legal field. I mean we have that benefit in our community. But those students that generally have issues with finding a job, sometimes it’s something that they are overseeing or they are overlooking I should say, like their resume needs to be perfect. I have talked to so many law office administrators that tell me the minute they see a mistake on a resume or on a cover letter, that resume or cover letter goes in the trash. It doesn’t even make it past that first look over or whatever that may be. So there’s no excuse for that, so that’s one thing, make sure that the resume you are putting out there, whatever is describing you on paper is perfect. Do mock interviews. Our students do mock interviews in the program so that they know how to interview, because if you get past that initial resume and they call you in for an interview, your interview needs to be perfect too. You need to be prepared. Other than that, networking is crucial. If you have local paralegal associations or the national paralegal associations like NALA or NFPA, you need to join those, because many times the jobs that are out there for paralegals may not be in the job listings. They may not ever be published. It’s by knowing somebody and someone is leaving a job and they let someone else know about that. So a paralegal association is a great networking opportunity besides just being supportive of your profession and getting to know other paralegals. If it’s about lack of experience, then like you said, they need to look for an internship or volunteer with a legal aid organization or do something like a domestic violence clinic. Unfortunately, there’s always those opportunities because we need them out there and they need volunteers. So anything you can do like that to enhance your resume is a great way to go also. Vicki Voisin: Okay. Well, I want to steer you back to technology for a minute, at one point in time all you had to have were keyboarding skills, and if you were good at that, then you were in; however, it doesn’t work that way anymore. And I know you teach technology in the program. Now, the standards that are set by AAfPE for — do they set standards for technological education too in the programs? Julia M. Dunlap: Yes, they follow some of the similar ABA guidelines in regards to that the students should be proficient in current technology. The difficulty and kind of what I mentioned earlier is that there’s just so much that you can do in a paralegal program in regards to technology. It’s hard to teach a student how to do eDiscovery when they don’t quite even know what discovery is. So we are limited in how far in the paralegal certificate programs we can go with technology. So in your earlier question about what can they — if they are having difficulty finding a job, then maybe they need to do further education, maybe they need to take programs like eDiscovery classes. We recently developed an eDiscovery certificate to kind of give our graduates or paralegals in the community the opportunity to do more education in the technology field. So our eDiscovery and litigation technology kind of tries to fill that void that the students might have coming out of a paralegal program. We could actually offer a paralegal certificate that is just about technology, but that then misses out on all the other topics and substantive areas of law that a program needs to cover. Vicki Voisin: Okay. And I would also suggest that some of the associations such as NFPA, NALA, NALS, all offer some classes that certainly both nonmembers can take and members. For instance, there’s PowerPoint classes and being able to use PowerPoint in your job is really important, or if you do something else, at least that’s a foundation for that. And there are classes for eDiscovery offered by the associations too, lots of different ones. So I would suggest that they go there and look at that after they graduate from your program. Julia M. Dunlap: Definitely, the paralegal associations, you can become a student member while you are in a program. They offer free MCLE seminars every month it seems and you have the opportunity to do that for free. Just staying current is critical, both for the attorney and the paralegal, but the more that you can — and I know that we are going to speak a little bit about certification, but we promote that for our students also, any way you can set yourself apart on your resume and show that you have gone that extra step to further your education, to highlight your skills to work on the basic skills that you have looks great to a future employer. Vicki Voisin: Well, before we do close Julia, I think it’s really important to talk about continuing legal education and also certification and I want to offer my two cents worth on certification before. I know you have got something to add to this. Everybody has to have some kind of education, and usually it’s a two-year program or a four-year program, but when they are through with their education, they are on a level playing field. They all have the certificate that they can say that they have, but the other thing is that they do need to set themselves apart, and perhaps they can — if they have their certification, which they can get right out of school, and some things like that, then they can — who are you going to hire, the one who just has their education or the one who has some other qualifications. So I think that we have to get them off that level playing field and understand that they have to do that. So what do you think about the importance of certification and also this continuing education? Julia M. Dunlap: Certification should be the norm I believe. I have taught a certified paralegal exam prep course for over 12 years, and when I first started teaching it, I think in California there were maybe about 200 certified paralegals for the whole state. Now we have just gone over — I think there’s about 1,200 now. So it’s definitely a trend. We are seeing more and more recognition. What you said about looking at two resumes and one person went that extra step to become a certified paralegal is going to mean something. It just shows a commitment to your profession, whether it’s the CPA exam through NALA or whether it’s the PACE exam through NFPA, which like you said, both of those exams you can take right out of your program. You don’t have to have certain years of experience. I know that you are an advanced certified paralegal. I find that my students who become certified paralegals, they are anxious to go that next step to now get the ACP, and we really promote it through our program, and AAfPE does also. One of AAfPE’s goals, we have a list of goals on our website, one of those is to create partnerships with the national paralegal associations like NALA and NFPA and support their certification exams. And in regards to continuing legal education, it differs from state to state; again in California we have one of the strongest codes in requiring that paralegals do continuing legal education. Vicki Voisin: Excuse me Julia, is that Section 6450 of the Business and Professions Code, is that what it is? Julia M. Dunlap: Yes, exactly. California Business and Professions Code §6450 et al actually was established in 2001 and it set the educational standards for paralegals in California. It has an ethical duty of confidentiality, which I always tell my students is a huge thing. It’s kind of the first time I have ever seen a specific ethical duty that applies to paralegals alone as opposed to you having to follow all the ethical requirements of your attorney, now you have your own ethical duty of confidentiality also. But §6450 also requires that paralegals in California do eight hours of continuing education every two years; four hours in ethics and four hours in general legal education. Not every state has that, but the trend that we are seeing in AAfPE is more and more states are going that way in requiring actual definitions for paralegals in their state and that requirement of continuing education. Vicki Voisin: Do you have the triple, I call it the triple LT because I can never remember what all those Ls stand for, do you have that in California? Julia M. Dunlap: Limited License Technician, we don’t have it in California yet. We have talked about it. The Legislature and the State Bar have looked into it. It seemed to be something that was going to happen for a while and now there’s been kind of a pull back on it, so I don’t see it happening in California at least in the next year or so. Vicki Voisin: I have noted that the paralegals in Washington, who were some of the first to get this, really are not having their own business, they are just doing more as they work for the attorney, which of course is a benefit to the attorney and all of that, so that’s always good. Well, do you have any other tips for our listeners as it comes to education or any of that topic, do you have anything for us? Julia M. Dunlap: Well, I think we have covered the main points is that, your education doesn’t end with your certificate, and I think it’s a danger just to assume that I learned everything I need to know, I have my paralegal certificate now, I am just going to go out and get the best job possible. You have to continue to stay current and do your own work. The attorneys know that they have their educational requirements, as far as continuing education, they know what they need to do to keep current, they want to hire people that have that same mindset. So as things keep changing, you have to keep changing. Vicki Voisin: Okay, that’s perfect advice, absolutely thinking that once they have their education, they are all set, which is not true, they have to have some experience. There are just a lot of things that go into getting their job. So Julia, if any of our listeners want to learn more about AAfPE or they want to get in touch with you, how would they do that? Julia M. Dunlap: Well, they are welcome to email me directly, and my email is just HYPERLINK “[email protected]” [email protected]. I am happy to answer any questions they may have about AAfPE, about the paralegal profession. There’s also a general email for AAfPE, which is just HYPERLINK “mailto:[email protected]” [email protected]. I would like to say our website has a lot of great information for people looking at the paralegal education, whether they are thinking about teaching in a paralegal program or whether they are looking to find a paralegal program. So there’s a lot of information on the website. But like I said, I am happy to talk to anybody about — I could talk about the paralegal profession all day. Vicki Voisin: Well Julia, thank you so much for being with me today. The information you shared is just invaluable to the paralegals in this profession, both those who are in the process of being educated or thinking about going to a paralegal school and also those paralegals who are already employed, either in a law office or in a corporation. So I appreciate that and I hope to run into you at a convention one of these days. Julia M. Dunlap: Yes, thank you Vicki, I enjoyed it immensely, and maybe I will see you in Albuquerque. The next AAfPE National Conference is in Albuquerque on October 18th through the 21st. So hopefully I will see you there. Vicki Voisin: Absolutely. Well, I was in Albuquerque last October for the Balloon Festival, so definitely. Julia M. Dunlap: Yeah, we are trying to at least coordinate one of our events at the Balloon Museum out there. Vicki Voisin: Oh, that would be great, great, wonderful place. So that’s a great choice. So thanks again and I will be watching for your articles and so forth. Julia M. Dunlap: Great. Thank You Vicki. Advertiser: We are glad you are listening to Legal Talk Network. Check us out on Facebook, Twitter and LinkedIn too. Vicki Voisin: Welcome back to The Paralegal Voice. This is one of my favorite times in the program, because I get to give you a practice tip, and they always vary. Sometimes they have to do with the program that we have had today, other times it’s just something that I want you to know about. So today I want to talk a little bit about soft skills and how soft skills are so necessary to boost your career. Most occupations will require that you have certain abilities. For instance, with the paralegal profession, you need to have your paralegal certificate from a school. Other professions such as, let’s say, computer programs, they have to know how to use programming language, so these are hard skills and you do need to learn those in some kind of an educational program. But I want to tell you about soft skills, and soft skills are the personal characteristic traits or qualities that each one of us has. They make up who we are. They encompass our attitudes and habits and how we actually interact with other people. They are not as tangible as those hard skills and you don’t learn those anywhere else. You can’t learn them by enrolling in a training program. You can acquire them though through education, work experience, your life experience, but it takes some effort on your part, first of all, to identify soft skills that you need, you personally, and then also to fix any issues that you might have. Some of the examples of soft skills would include verbal communications, writing, writing skills, you do learn some of that in college, but you still have to be able to really relate information with your written words. Then there’s problem solving and active listening. You have to be able to listen to people, not do all the talking and not be thinking about someone else or something else while they are doing their — while they are talking to you. You need to be an active learner. You need to always be willing and able to acquire more knowledge and then apply that knowledge to your job. You need strong organizational skills and there’s lots of information on that out there, but you always have to keep working on your soft skills. They do allow you to use your technical skills and knowledge, because they are going to help you get a job, and you need those characteristics such as, first of all, whenever you are looking for a job and you will see an ad for that job, you may list these qualities that you need, such as excellent communication skills or strong organization skills or team player, they will be listed right in those ads. So even if you have the technical skills that are required for a job, you have to be able to demonstrate the specific soft skills that you have or you probably won’t even get the job. So make sure your resume lists accomplishments that demonstrate these soft skills, and that comes right down to having a perfect resume, as Julia told us. You also need to find ways to discuss these in your job interview. So the message I have for you today is that you have to work on your soft skills. Identify what are lacking and then go ahead and find some ways to make those better. That’s all the time we have today for The Paralegal Voice. If you have questions about today’s show, please email them to me, that’s HYPERLINK “mailto:[email protected]”[email protected]. Don’t forget to check my website, HYPERLINK “http://www.paralegalmentor.com” paralegalmentor.com, and also that will take you to my blog, where I have articles and other information for you. Also be sure that you are exploring all of these resources that I offer, because they are designed to move your career in the right direction, and that’s always forward. This is Vicki Voisin, thanking you for listening to The Paralegal Voice and reminding you to make your paralegal voice heard. Thanks for listening to The Paralegal Voice produced by the broadcast professionals at Legal Talk Network. Join Vicki Voisin for her next podcast on issues and trends affecting paralegals and legal assistants. Subscribe to the RSS feed on HYPERLINK “http://www.legaltalknetwork.com” legaltalknetwork.com or in iTunes.